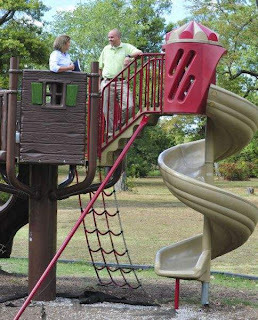 Work is expected to get under way Sept. 27 on a $650,000 project that will include a large playground catering to disabled children and a companion sprayground next to the Big Pavilion at Shawnee Park in western Louisville. The playground designed to allow disabled youngsters and other children to play side by side should be open next spring, said Margaret Brosko, spokeswoman for Louisville Metro Parks. Metro Parks is sponsoring the project along with the Olmsted Parks Conservancy and the DREAM Foundation. This will be the third local “inclusive playground” in which the DREAM Foundation and the Olmsted Parks Conservancy have had a hand. A small, demonstration project opened at Des Pres Park off Lowe Road in 2004 and a large facility after which the Shawnee site will be modeled opened at Iroquois Park in 2007. The DREAM Foundation was created by Mitch and Meredith Barnes of Louisville, after doctors diagnosed their son, Mitchell, with Duchenne muscular dystrophy, a crippling form of muscular dystrophy, in 1998 The foundation stands for Duchenne Research Education and Miracle Foundation. Their son is now a sophomore at Male High School and is expected to attend a 10:30 a.m. ground breaking at Shawnee Park. An existing five-year-old small playground just off the one-way loop road at Shawnee Park will be moved about 100 feet and be incorporated into the new play area, which will feature a large play structure with swings, slides and other equipment. It will have four decks on four levels and a series of ramps with handrails leading from one level to another that will allow wheelchair access. There also will be “transfer stations” where a child can move or be moved from a wheelchair to a piece of play equipment. There will be a separate jungle gym-like structure called a child fitness circuit and elements that can be rocked back and forth by groups of children to promote teamwork, said Paul Adams, a sales agent with Countryside Play Structures of Parker City, Ind., which built the equipment. sprayground. It will have about 15 nozzles shooting water jets. The main part of the sprayground will be built to resemble a paddle boat, with two “smokestacks” from which water will be emitted. The surface will be a blue rubberized material intended to represent water. The funding for the projected included $300,000 from Metro Parks, $200,000 from the DREAM agency and $150,000 from the Olmsted group. Officials said the DREAM Foundation continues to raise money for playground projects. Metro Parks has numerous play areas with at least some equipment that is accessible to the disabled, Brosko said. Jack Will, the foundation’s development director, said plans are afoot to develop “play together playgrounds” at local schools, including one that will be announced next week planned at Cane Run Elementary Community School.